What’s one of the most fun things about playing video games? Well, it depends on who you ask, but almost everyone would put grinding near the bottom of the list. It’s where you raise your character’s level and stats by fighting boring characters over and over and over and over and over and over and over and over again. However, grinding is the best way to get your character to become the coolest and strongest. So you could either grind … or you could just buy someone else’s character from them. Yes, that’s right, there are a bunch of people who make money by playing the game—the same way we might—and then turning around and selling that character to other people. Take, for instance, Shane Jeffreys. 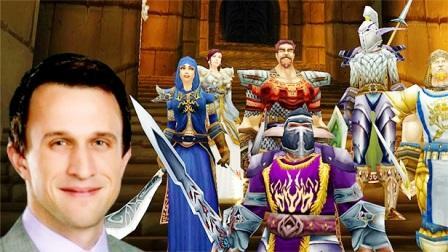 He has made almost half a million dollars selling various World of Warcraft accounts. Because, see, while WoW is super popular, it’s also super bad.. One WoW character sold for $10,000, just by itself, a digital character that someone else played. The game itself costs less than $100. That’s like buying a house for $100,000 and then spending a billion dollars on a nice shiny (yet still used) toilet. It’s the digital equivalent of buying ripped jeans. But, hey, at least Shane Jeffreys is happy with it. Maybe we should start playing WoW too?